Several people have contacted me asking how to get information about a family member who served in the military in World War II. I do not profess to be an expert on researching individual veteran’s records but since I have done some research I can provide a little guidance. I have been immensely fortunate that I have records directly from the veteran for my most immediate family members who served in WWII. I have a copy of my father’s discharge paper and a box of letters he wrote to my mother during the war. We have my father-in-law’s copy of his unit history from the 276th Armored Field Artillery Battalion. These histories were published right after the war and I have learned that they are both rare and valuable. The family also has his discharge paper. These can be very helpful as a starting place in searching for records. On the other hand, last year when I was searching for information about my father’s cousin, Herman Connell Jr., who was killed in Europe in 1945, I found out just how difficult it was when you had very little specific information about the soldier. All I had was his name and the unit he served in which was on his gravestone. I was able to compile a story about his unit and the action they were in at the date of his death but I couldn’t get any specific information about his individual experiences. The inquiries I received prompted me to look for some guide to searching for records. What I found was an excellent book which contains an enormous amount of information. 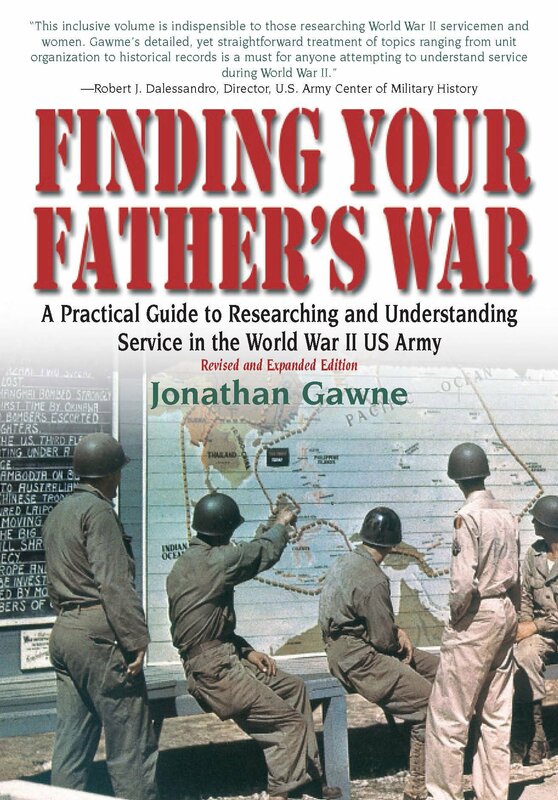 “Finding Your Father’s War” by Jonathan Gawne is a must-have book for anyone looking for information on someone who served in the U.S. Army during World War II. I would even go so far as to say that it is a must-have book for anyone writing about World War II. It deals with the Army only, no Navy or Marines. It does include information about the Army Air Corp since during WWII the fly boys were part of the Army. It wasn’t until after the war that the Air Force became its own branch of the service. One of the main reasons Gawne focused on the Army was that a fire in 1973 destroyed much of the individual service records as well as the company level records. The Navy, Marine and Coast Guard records were not burned and are available through those branches. Some things discussed in “Finding Your Father’s War” I had already figured out from various sources. If I’d had this book it would have been so much easier and faster. There are other useful tidbits in Gawne’s book that I did not know. If you are trying to put together the pieces of someone’s military service these little details can yield a wealth of understanding. I’ll give you some examples just to give you a feel for what I am talking about. One of the things that I had already figured out from the many memoirs I’ve read was the structure of an Army Infantry Division. Each division had three infantry regiments thus it is referred to as a triangular organization. A division also had division artillery and division headquarters where all the support units were attached. Continuing with the triangular organization each infantry regiment was divided into three battalions plus headquarters. Although each infantry regiment had a unique number (the 30th Infantry Division consisted of the 117th, 119th and 120th Infantry Regiments), the battalions were simply numbered 1st, 2nd and 3rd (so the 117th Infantry Regiment had a 1st Battalion, a 2nd Battalion and a 3rd Battalion plus Headquarters). Each Battalion was made up of three rifle companies and a heavy weapons company. A letter designated each company but the letter designation wasn’t the same in each battalion. Instead it went like this: 1st Battalion consisted of Company A, Company B, Company C and Company D, the last being the heavy weapons company; 2nd Battalion consisted of Company E, Company F, Company G and Company H, again with the fourth one being heavy weapons; 3rd Battalion consisted of Company I, Company K, Company L and Company M, again Company M was heavy weapons and the letter J was skipped. So if you know your Army veteran was in Company H, he would have been in the heavy weapons company of the 2nd Battalion. This can be helpful since many historical accounts of battles refer to the battalion. Something I learned from “Finding Your Father’s War” is that the soldier’s serial number isn’t just a random number assigned when he entered the service. The number will tell you something about the soldier. Serial numbers with no letter prefix means the soldier was an enlisted man. The prefix “O” indicates he was an officer. Others with letter prefixes included nurses, warrant officers, WAC’s and others. If the first number was a “1” the soldier was an enlistee. If it was a “2,” he was in the National Guard. A “3” meant he was drafted. Late in the war some draftees were given serial numbers starting with a “4.” The second digit in the serial number tells the geographic region of the country the soldier was in when he entered the service. These numbers correspond to the service commands within the United States. A map is included in the book. In addition to this book there are numerous resources online that can help you. The National Archives, the Center for Military History, division organizations websites and Facebook pages, and even sites like Ancestry.com and Fold3.com. Local historic societies and local newspapers may be a source since many servicemen had articles written about them during the war. Family stories and even old pictures can provide clues especially if you know what to look for. Good luck in searching for your WWII veteran’s records. It is always fascinating to learn about an individual’s service during the war when millions were in uniform and had such a variety of experiences. My research into Tennessee’s contribution to WWII is not complete without a chapter on Oak Ridge, undoubtedly the largest and most significant war project in Tennessee. And the most secretive. The first atomic bomb was detonated over Hiroshima, Japan, on August 6, 1945. The uranium isotope U-235 used in that bomb was produced at the Clinton Engineering Works in Oak Ridge, Tennessee. Yet a mere three years before that ominous event the town of Oak Ridge and its massive plants did not exist. Much has been written about the Manhattan Project and the atomic bomb. There are the scientific aspects and the military aspects. But my interest lies in the people – who they were, where they came from, how the war affected their lives, what their lives were like at Oak Ridge, and of course the possibilities of romance. Recently I read two books about Oak Ridge that provided fascinating insight into the town and the people who lived there. 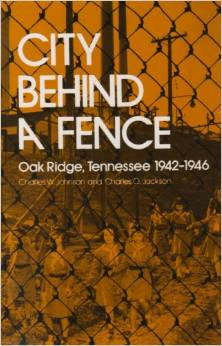 “City Behind a Fence, Oak Ridge, Tennessee 1942-1946” by Charles W. Johnson and Charles O. Jackson tells of the origin of the town and how the people lived in Oak Ridge. 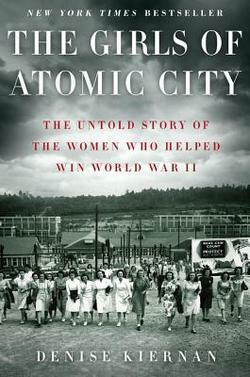 “The Girls of Atomic City, the Untold Story of the Women Who Helped Win World War II” by Denise Kiernan recounts the stories of several women who worked at Oak Ridge during the war while relaying the tale of the progress of the atomic bomb during the war years. Both books are fascinating and I highly recommend them to anyone interested in Oak Ridge. In the fall of 1942 the Army Corp of Engineers began acquisition of 59,000 acres in Roane and Anderson counties, about twenty miles from Knoxville, Tennessee. With no negotiation, the Army informed land owners that their land was to be taken for a government project and gave them from two to six weeks to vacate. No information was provided about the project. When Tennessee Governor Prentice Cooper learned of the government actions construction was already under way. He was understandably furious and accused the Army of establishing a New Deal experiment in socialism disguised as a war project. This sentiment persisted among people of the area for years. All types of workers made their way to Tennessee to work at Site X for the Clinton Engineering Works or one of their contractors. The original estimate of 13,000 residents grew until the population reached 75,000 in 1945 making Oak Ridge the fifth largest city in Tennessee. Recruitment advertising for workers was of necessity intentionally vague. Scientists and construction workers, guards and secretaries, and many more traveled to an unknown non-existent destination to work on a war project. Soldiers preparing to go overseas were reassigned to the project with no explanation. Many young women from Tennessee and the surrounding states sought the good paying jobs without questioning what they would be doing. To these workers the secrecy of the project meant it was important to the war effort. Johnson and Jackson describe the development of the town of Oak Ridge, with planning for housing, shopping, schools and recreation. As the demands of the project grew the challenges of running a town increased, especially with the tight security. With housing a constantly increasing need and continuously under construction, many workers lived off-site and either drove or rode the extensive bus system to and from work. The Oak Ridge bus system became one of the largest in the entire country. Housing within the reservation consisted of pre-fab single-family homes, small apartments, dormitories, trailers and hutments. This is only a sampling of the fascinating information in the book “City Behind a Fence.” Definitely worth the read. “The Girls of Atomic City” is also fascinating and well worth the read. Kiernan tells the stories of several women from different places doing different jobs all brought together in this one very unusual place. The writing style resembles that of a novel with plenty of personal detail and emotions from the viewpoint of the women themselves. Two secretaries, a leak tester, a chemist and a statistician are some of the ladies who tell their stories of a place where the one question they couldn’t ask a new acquaintance was “where do you work?” Limits on what could be discussed didn’t prevent friendships from forming or romances from blossoming. Kiernan alternates chapters about the women with chapters about “tubealloy,” the code name for uranium. As in a mystery or thriller, Kiernan unveils the story of the scientists, the research and the conversion of theory to production under the pressure of war. The locals often commented on how much material went into the site and nothing came out, no planes or ships or tanks or anything. Another memorable feature of the town to those who lived and worked there was the mud. Everywhere the workers went, the mud covered shoes and trousers identifying them as being from behind the fence. Information was so compartmentalized that workers only knew what they needed to do their job. Very few knew the overall purpose of the project and the veil of secrecy prevented any open discussion or speculation. So most were as surprised as the rest of the country when President Truman announced that the bomb had been dropped on Japan and mentioned Oak Ridge’s contribution. Both books provided me with much food for thought as I craft my love stories during World War II. Don’t be surprised if Oak Ridge shows up in a future romance novel. On a personal note I will share my small connection with Oak Ridge. In the 1950’s my uncle worked at Oak Ridge. As children my sister and I spent a week with our cousins there and had a wonderful time. We had no idea of the significance of the place. We just knew if was very different from the small town where we grew up. When our parents came to get us, I remember my uncle driving us to the gate. Flanked by fences, guard towers, and armed guards, even to a small child it was ominous and memorable. Our parents spoke of the high security at the facility but it was much later before we understood the significance. A later visit to the American Museum of Atomic Energy explained some of it. 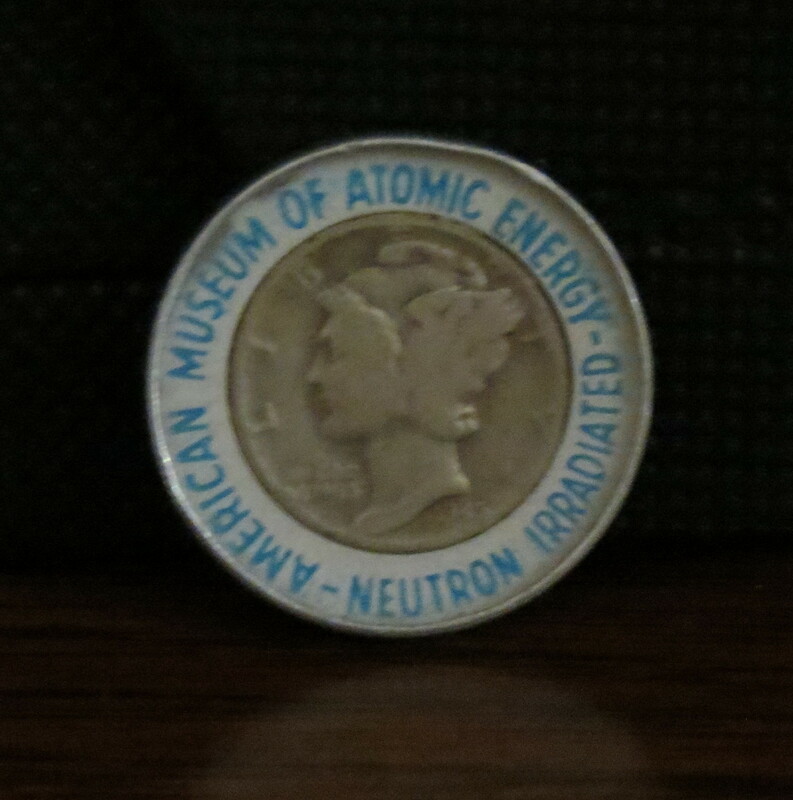 I still have my souvenir from the museum – an irradiated dime. They told us the dime would always be radioactive but it would diminish over the years. A simple way to explain radiation to kids. My uncle transferred to the facility at Los Alamos and my sister and I were lucky enough to go there for a visit, too. I grew up in Middle Tennessee and heard stories about the Second World War all my life. I thought I knew a lot about what went on the area. I have been using places in Tennessee as settings in my books or as background for my characters. To ensure that I was accurate and to add depth to the novels, I researched numerous aspects – from the military presence to industrial plants to medical facilities. Here are a few things I learned, some of which I had not known before I started my research. Historically Nashville wasn’t as industrial as Memphis or Chattanooga so it’s not often though of in terms of World War II defense industries. Yet Nashville did produce war materials. The AVCO plant has produced aviation equipment for years. In my research I learned that the Consolidated Vultee Aircraft Corporation constructed the Nashville Plant to produce aircraft for the war. The Vultee A-31 Vengeance dive bomber and the P-38 Lightning fighters were the main output. And a third of the employees were women. Another example of how women filled critical roles in industry while the men were in uniform. 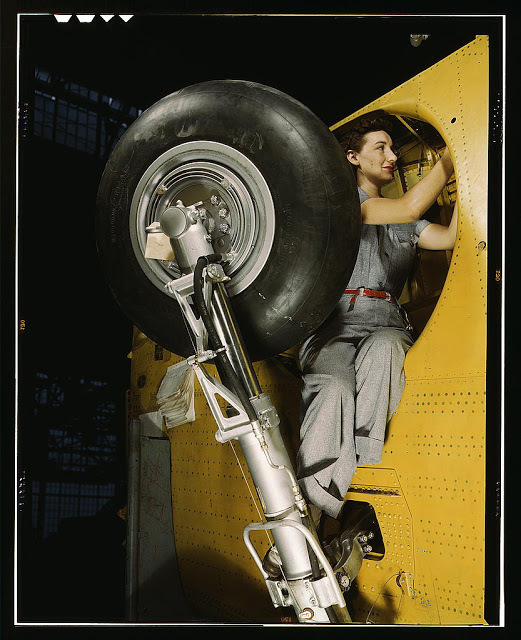 This woman is working inside a wheel well, at Vultee-Nashville. 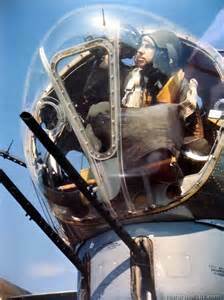 She is working on a “Vengeance” diver bomber. Other Nashville industries were involved in production of war materials. Nashville Bridge Company built minesweepers for the Navy. Dupont supplied synthetic fibers for parachutes; General Shoe made combat boots and Werthan Bag manufactured sandbags. South of Nashville, in the Columbia area, Monsanto Chemical Company produced phosphorous and Union Carbide produced whetlerite charcoal for gas masks and amorphous carbon electrodes for steel production. Although I knew about military bases in Middle Tennessee, I never knew much about Camp Forrest or what an important role it played during the war. Situated near Tullahoma, the Army expanded the Tennessee National Guard’s training center in 1940 when the National Guard units were federalized. After the attack on Pearl Harbor Camp Forrest became home to the Eighth and Eightieth Infantry Divisions as well as a training and induction center for men entering the Army. 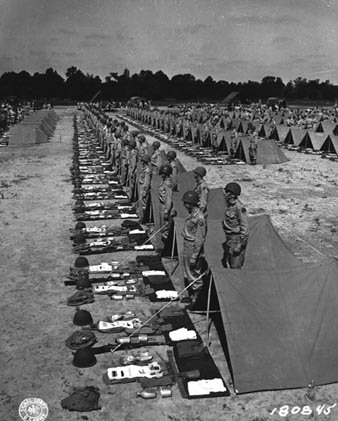 Numerous infantry, artillery, engineering and signal corps units trained at Camp Forrest. Ethnic German and Italians, as well as Japanese civilians, were interred at the beginning of the war. In 1942 800 civilians were interred at Camp Forrest. In 1943 German prisoners of war arrived. Approximately 24,000 prisoners were held there during the war and as many as 68,000 were processed through the camp before internment at other facilities. With wounded POW’s in need of medical care, Camp Forrest was chosen for one of three POW Hospitals across the country. Since the terrain of Middle Tennessee closely resembled that of Europe, the area became the site of what were known as Tennessee Maneuvers. Camp Forrest provided logistical support for these simulated combat exercises. Spread over twenty counties, the headquarters for the maneuvers was at Cumberland College in Lebanon. Between 1942 and 1944 hundreds of thousands of troops honed their combat skills in Tennessee – including General Patton’s 2nd Armor “Hell on Wheels” and the 2nd Rangers famous for their assault on Pont-du-Hoc on D-Day. I found a book by Woody McMillin “In the Presence of Soldiers” about the Tennessee maneuvers. It looks like it would be an interesting read. Click here for a good article about the maneuvers and the book. After the war the Army surplussed Camp Forrest. The Air Force created the new Air Engineering Development Center, later renamed Arnold Engineering Development Center for Air Force General “Hap” Arnold, on the site. Since the war this facility has become the most advanced and largest complex of flight simulation test facilities in the world. Another WWII military site in Middle Tennessee was Smyrna Army Airfield. Designated a specialized four-engine (heavy bomber) pilot training airfield, cadets practiced flying both B-17’s and B-24’s while stationed in Smyrna. After the war, the Air Force took over the site and renamed it Sewart Air Force Base for Tennessean Allan J. Sewart Jr. who died in a bombing mission over the Solomon Islands in 1942. Berry Field, better known today as Nashville International Airport, became an Army Airfield prior to WWII with the 105th Observation Squadron. Later the B-25 Mitchell, a medium bomber, flew out of Berry Field. The Berry Field Air National Guard Base still occupies the site. The best known military base in Middle Tennessee is Fort Campbell, home of the 101st Airborne Screaming Eagles. Camp Campbell was established in 1941 on land that straddles the Tennessee-Kentucky line near Clarksville, Tn. and Hopkinsville, Ky. During WWII this newly established base trained the 12th, 14th and 20th Armored Divisions and the 26th Infantry Division. And on a personal note, the 276th Armored Field Artillery Battalion and their sister units trained at Camp Campbell. My father-in-law was in the 276th AFA and during his training at Camp Campbell he met and married my mother-in-law. I also researched the medical facilities in Middle Tennessee related to the war effort. Thayer General Hospital in Nashville was one of the Army’s General Hospitals established across the country to treat wounded military personnel. Hospitals in the “Zone of the Interior” were named while those that served overseas were given numerical designations. After the war the Veterans Administration took over the facility. Dr. Oliver Carmichael, President of Vanderbilt University, was actively involved in establishing the U.S. Cadet Nurse Corps which trained nurses across the country to alleviate the nationwide shortage of nurses. Other Nashville hospitals participating in the Cadet Nurse training program were Meharry Medical, Nashville General, Protestant and St. Thomas Hospitals. Men and women from Middle Tennessee who were not in the military during the Second World War worked to win the war, too. Farmers stayed behind to raise the much-needed food. Women went to work in various capacities to fill the vacancies the men left behind. Men who for various reasons were unable to serve in the military worked on the homefront. Production ramped up. Belts were tightened. Everyone contributed in some way. Had they not, the Allies might not have defeated the Germans and the Japanese and our world would be very different today. Since Tennessee is my home, where my family lived for generations, I use locations in the state for my World War II love stories. My research has turned up some interesting information about Tennessee during World War Two. 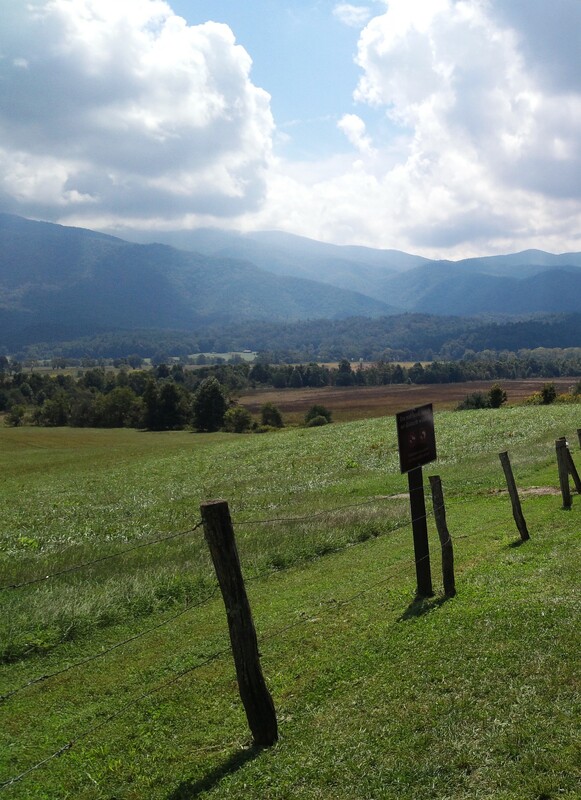 When you see the beautiful mountains of East Tennessee it is hard to imagine how the region could have contributed to the war effort, yet Tennesseans in this area did much to win a war being fought thousands of miles away. Not only did their sons and daughters fight in the armed forces but the people at home worked hard to support them. For now I’ll skip over the enormously important Oak Ridge facility and focus on the activities in the rest of the eastern portion of the state. Many Tennesseans were inducted into the Army just across the Georgia border south of Chattanooga at Fort Oglethorpe. Established in 1902 the fort was the home of the Sixth Calvary. At the beginning of WWII the Army expanded and transformed Ft. Oglethorpe into an Army induction center. In 1943, it became the third training center for the newly established Women’s Army Corps after Ft. DeMoines, Iowa, and Daytona Beach, Florida. Ft. Oglethorpe also housed Prisoner’s of War. Chattanooga had been an industrial center prior to the war so its industry naturally converted to the production of war materials. Combustion Engineering produced piping and boilers for ships and other military uses. Air Products Inc. manufactured portable and stationary oxygen generators for both medical and aviation use. Men flying missions over Europe used bottled oxygen to breathe at high altitudes. Heavy duty military tires for jeeps, 2 1/2 ton trucks and half-tracks were made at Mohawk Rubber company. Southern Ferro Alloys Co. produced ferrosilicon for the steel industry. And a new ordnance plant, Volunteer Ordnance Works, was built to produce TNT for war use. Other Chattanooga manufacturers converted from civilian production to war materials. Cavalier Corporation converted their furniture production to ammunition boxes. Chattanooga Stamping and Enameling shifted from making vitrious-enameled products to manufacturing things like gasoline cans, anti-tank mines, and cargo hoist assemblies. A manufacturer of oil field equipment, the Wheland Company, switched to producing 90 mm and 75 mm guns. Chattanooga’s Baroness Erlanger Hospital trained nurses as part of the Cadet Nurse Corps which the government created to alleviate the shortage of trained nurses. Other East Tennessee hospitals that participated in the Cadet Nurse training program were Appalachian in Johnson City and Fort Sanders, Knoxville General and St. Mary’s in Knoxville. Just east of Knoxville in Blount County, the Aluminum Company of America (Alcoa) had built a plant for smelting aluminum ore in 1913, choosing the site because the Little Tennessee River rushing through the mountains had the potential for generating the enormous amount of electricity needed for the smelting operation. In 1919 the area surrounding the original plant incorporated as the town of Alcoa, Tennessee. By the outbreak of World War II in 1941 Alcoa already produced light-weight aluminum for airplanes. During the war their production increased by 600% with a work force soaring to 12,000. The North Plant, built in the early 1940’s, was at the time the world’s largest plant under a single roof. Alcoa and their employees contributed much-needed aluminum in various forms for the war effort. Another important contributor was Tennessee Eastman Corporation. 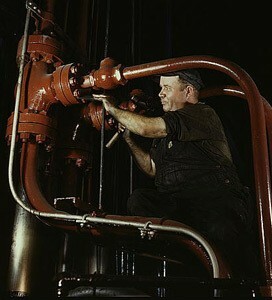 The subsidiary of Eastman Kodak built the Holsten Ordinance Works near Kingsport in 1942. As a contractor for the US government the plant produced the powerful explosives RDX and Composition B, a mixture of TNT and RDX. During WWII this plant became the world’s largest manufacturer of high explosives. Tennessee mining operations provided coal which Tennessee Products Corp transformed into coke at their Chattanooga plant. The same company produced ferro-manganese and pig iron at Rockwood. At Copperhill, Tennessee, site of a long-time copper mining operation, Tennessee Copper Company manufactured sulfuric acid for production of TNT. Elizabethton’s North American Rayon Corporation produced viscose rayon yarn for use in war materials. Made from wood pulp, rayon was considered the first synthetic fiber, although it was made from a natural source. In Johnson City, Harris Manufacturing Company made shells. Knoxville industries also converted to war production. Electro Manganese Corp contributed electrolytic manganese, essential for making steel. Rohm and Haas Company built a plant to manufacture methyl methacrylate sheeting or plexiglas for use in submarine periscopes, airplane canopies, windshields, and the bombardier’s nose compartment in the B-17 heavy bomber. Throughout the war the Tennessee Valley Authority generated electricity to power aluminum production, the secret Oak Ridge facility and various other industries across the entire valley. To meet the demand, by 1942 TVA had twelve dams and one power plant under construction. One of those dams was Fontana, completed in 1945. 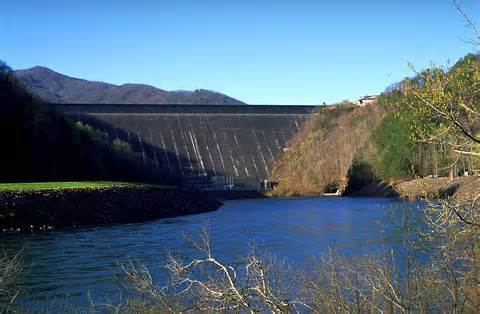 This enormous, 480 ft. high, concrete dam on the Little Tennessee River sits on the eastern edge of the Great Smoky Mountains National Park. Douglas Dam on the French Broad River went into operation on March 21, 1943, after only 12 months and 17 days of construction. Demand for power by both the aluminum industry and the Oak Ridge site spurred the break-neck speed. Other dams that came online during the war years were Watts Bar, Cherokee, Ocoee, Appalachia, Ft. Loudoun, and Kentucky. East Tennessee’s citizens served in every branch of the armed forces which left few able-bodied men on the home front to staff the industrial plants and construction sites. Throughout the war industries struggled to recruit and keep employees. Men too old to fight, men who did not meet the physical requirements of the military, African-American men and lots of women, both black and white, worked in the plants. Most of the women had never worked outside their homes before the war. Although the government discouraged employees from moving from one war industry job to another for higher wages or benefits, it was a constant problem. Shortages of materials also plagued the war plants. While loved ones fought overseas, both patriotism and the chance to make real money after years of depression spurred the workers in East Tennessee to work long, hard hours for a common goal. Win the war! In researching my current novel-in-progress, I immersed myself in the mindset of the WWII soldier by reading memoirs of men who had similar experiences as my fictional character. After reading many memoirs as well as historical accounts, I have found that memoirs provide more insight into the personal experiences – from their daily activities to what they knew and felt about the war. Letters and journals written at the time convey the emotional state of the soldier. And they record the minor details of life, fertile soil for the fiction writer who wants to transport the reader into the world of WWII. Since I had already decided that my hero served in the First Infantry Division and was wounded soon after D-Day, I searched through the many memoirs available online for someone who served in the First in the early part of the war. 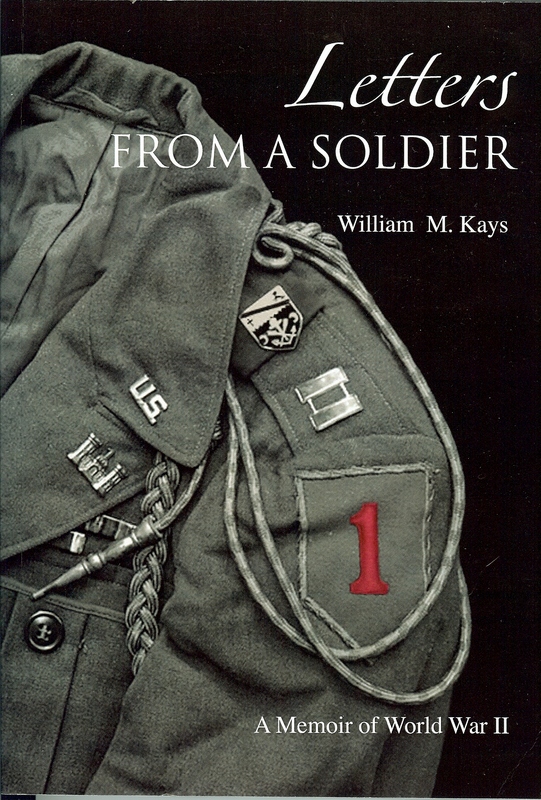 I discovered “Letters from a Solider” by William M. Kays. The well-written account provides letters and pictures pulled together by the author’s vivid memories of the events, the people and the locations. Bill Kays entered the Army as a Second Lieutenant after graduating from Stanford where he went through the Reserve Officer Training Corp (ROTC). Both his letters and his recollections of his early experiences in the Army convey just how ill-prepared the United States was for war. Many of the young officers came straight from college where their military training varied greatly. Others had gone through the Army’s Officer Training Schools (OCS) which were necessarily brief. Kays makes no bones about how incompetent he felt as he boarded the overcrowded Queen Elizabeth for England on August 30, 1942, only two short months after his induction. Once in England Kays was assigned to the First Infantry Division, which was already in England. Despite the fact that he had no training in combat engineering, Kays became an officer in the 1st Engineering Battalion. In “Letters from a Soldier” Kays provides a vivid account of training at Fort Leonard Wood, Missouri, of the voyage to England, and of his stay in England and Scotland before shipping out to North Africa. As a writer, his accounts gave me insight about how officers and enlisted men were trained and assigned to various units. In Kays case, he later figured out that in an attempt to get away from Fort Leonard Wood, where he was miserable, he had volunteered for overseas duty. So instead of getting him into another school for training, he landed on the fast track to overseas and combat. Since I had read very little about the campaign in North Africa or the invasion of Sicily, Bill Kays’ book provided the background I wanted for my character. My story will pick up much later after the soldier is wounded, but I needed a back story. From Kays’ account I can piece together what my character experienced early in the war and how those experiences influenced him later. The memoir provided details like how long it took for letters to get to the soldiers at various times and locations and that the soldier had to make a request in his letters so that civilians could send him packages for things as simple as cookies or wool socks. The letters also show how his concerns and interests changed over time with interest in what was going on back home dwindling. Vivid accounts of the weather, food, or lack thereof, and living conditions put the reader alongside the soldier. For instance, he gave descriptions of how mud infiltrated everything (yes, even in North Africa, it rains) or how they traded with the locals for eggs to supplement their bland diets. Kays describes the invasion of Sicily as he watched it from shipboard since his regiment was held in reserve and went ashore later. He tells of watching the naval guns shoot down planes carrying our own airborne soldiers, presumably due to lack of communication between the Navy and the Army Air Corp. One of the many foul-ups during the war, yet one I had not heard before. Later, Kays gives one of the best accounts of the D-Day landing on Omaha Beach I have ever read. Through his vivid memories the reader experiences the day with him. As a combat engineering officer assigned to the 16th Regiment, he knew that the beach defenses should have been destroyed before the infantry landed. When he saw them intact, he believed the landing would fail and that they would all be killed. Yet he stepped off that landing craft onto the beach and fought to survive. Little did he know that in the next year he would fight his way across Europe – and live to tell about it. Other memoirs on my shelf include “Roll Me Over” by Raymond Gantter, “If You Survive” by George Wilson, “A Soldier’s Journal” by David Rothbart, “Visions from a Foxhole” by William A Foley, Jr., “Our War for the World” by Brendan Phibbs, and “One Man’s War” by Tommy LaMore. All these deal with the war against the Germans. The war against Japan constituted a whole different experience and, while it was fought largely by the Navy and Marines, many forget that the Army played a big role. My uncle and several others from our small town in Tennessee spent the war in the South Pacific in the Army fighting the Japanese. So ideas are swirling for more stories. When my sister-in-law visited us this month she brought with her a stack of old pictures, many of which we had never seen before. Most of the pictures were of members of my husband’s family. Both sides were represented, his father’s family and his mother’s family. I scanned them all. Then we decided to identify as many people as we could. Some had names written on the back. Some had things like “mother” or “grandfather” written on them. We had to know who wrote on it to determine who was in the picture or, in some cases, we recognized them from other pictures we had. What started out as simply scanning the pictures turned into a major project of genealogical research. Seated – L J and Joannah Howell. Technically, I had to figure out how to put the names of the people on the scanned photos. I tried using the software we got with the camera we bought a couple of years ago, but many of the group photos didn’t have room to type all the names in a text box. Then I discovered that when viewing the scanned photo in Windows 7 Pictures I could add a comment to the file. So I typed the names of all the people we could identify into this comment field. You can’t see the field when viewing the pictures in slide-show mode, but you can have the information as part of the picture’s file. To help get the names right, I signed into Ancestry.com where my son created an extensive family tree. My sister-in-law had never been on Ancestry.com. She was so impressed she decided to sign up for membership when she got home. Together we searched the families and filled in the names. Of course, we got sucked into the genealogy. I showed her how we could search for details on a person by searching census records and military records. I also shared with her some records that I had printed out. We spent hours searching, reading and updating. It’s funny how you see different pieces of information and then suddenly make the connection. An example is the research I did for my husband to find the ancestor who served in the Confederate Cavalry and rode with Nathan Bedford Forrest. He’d heard stories from his grandmother and great-grandmother who at one time had some old pistols and a uniform. But he was so small that when he grew older he questioned the truth of the stories. The artifacts had been long ago sold or given away. So I searched and found that Lee J. Howell served in the 18th Tennessee Cavalry Regiment which was organized in West Tennessee where they lived. The 18th came under the command of General Nathan B. Forrest in 1864. We were looking up members of the Howell family to help understand the names and relationships of the people in the pictures. That’s when I put two and two together and realized Lee J. Howell was my husband’s Great-Great-Grandfather. 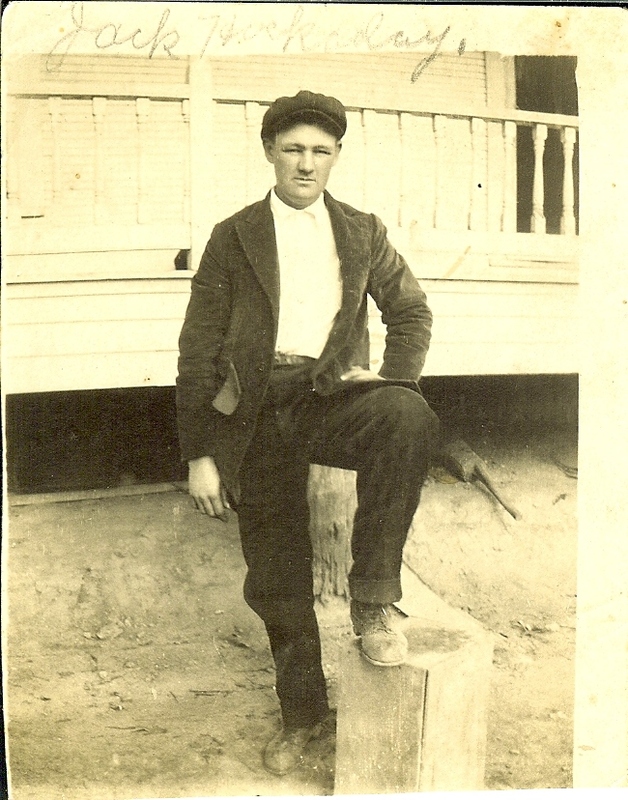 His full name was Levi J. Howell, but according to census records he went by Lee. 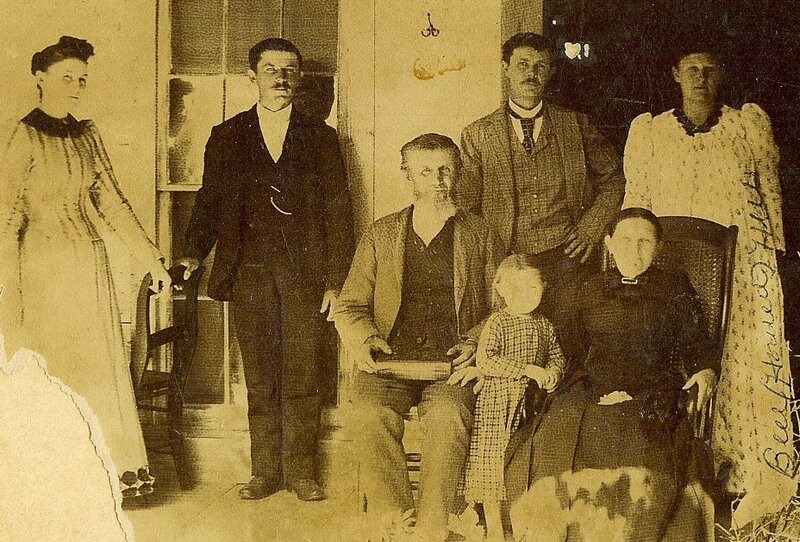 And the Great-Grandmother who told my husband the stories about the Civil War was Lee J. Howell’s daughter, Bell. I also found Lee J. Howell in the 1920 census at age 87 living in the household of his son-in-law, which means he was living with his youngest daughter who had married a man named William Hockaday. That solved the mystery of the pictures which had written on them names of members of the Hockaday family. Before making this discovery we didn’t know who the Hockaday’s were. Research into families can be fascinating, especially when various pieces of information are shared. Each piece adds something to the puzzle. Was my great-grandmother a real estate mogul? Not likely. But she did buy and sell real estate at a time when women were supposed to stay home, keep house and raise children. We’ve found her name on several deeds, from 1892 to 1914, some in prime locations in the downtown district of the thriving community. She passed on her real estate savvy to her son, my grandfather, who invested in several land parcels. Disposing of his real estate sent me on a search where I found more than deeds. Old deeds can provide another tool for genealogical research. 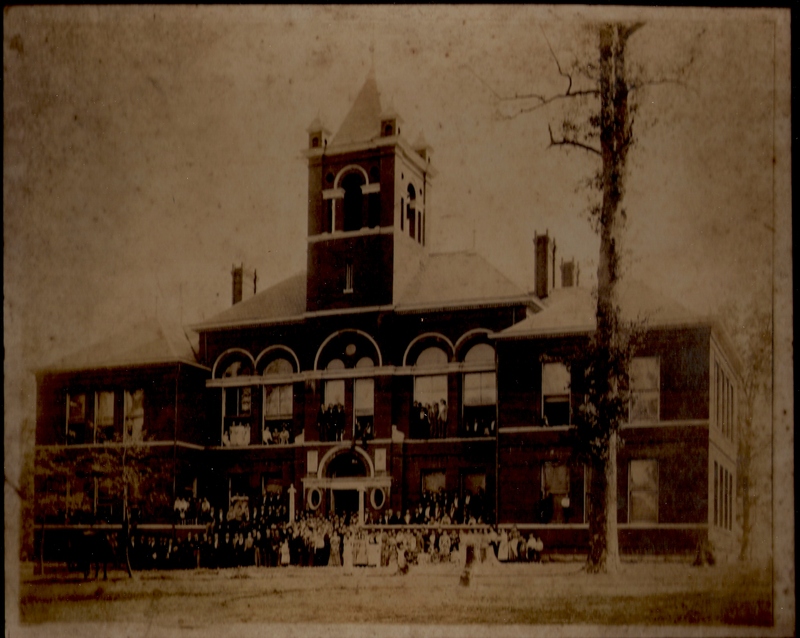 Although they are not likely to be available on the internet, if you are willing to search through courthouse records, they can provide a valuable resource in learning about your ancestors. Which is what I have done, not for the sole purpose of genealogy, but for the purpose of settling an old estate. It might seem incredible to some but my grandfather’s estate, at least the real estate portion of it, has never been settled. Not so bad you say, except he died in 1921. Yes, that’s ninety-one years ago. He left a widow and nine children, including my four-year-old mother. All the children are gone now, so it is up to the grandchildren to settle his estate. With so many heirs, the property must be sold and the proceeds divided up. After the lawyers take their share, no one will get much, but my hope is to get it settled before the hundred-year mark. Before selling real estate you must have the deed. The task of locating these documents has proved to be difficult. Although my family paid the real estate taxes all these many years, when the lawyers searched for the deeds they couldn’t find them all. Or rather, they couldn’t match the deeds they found with the property. So my dear brother and his wife went to the courthouse and scanned every deed they could find that might be related to our family. Scanning them was an enormous task. Reading them and making sense of them proved to be something entirely different. 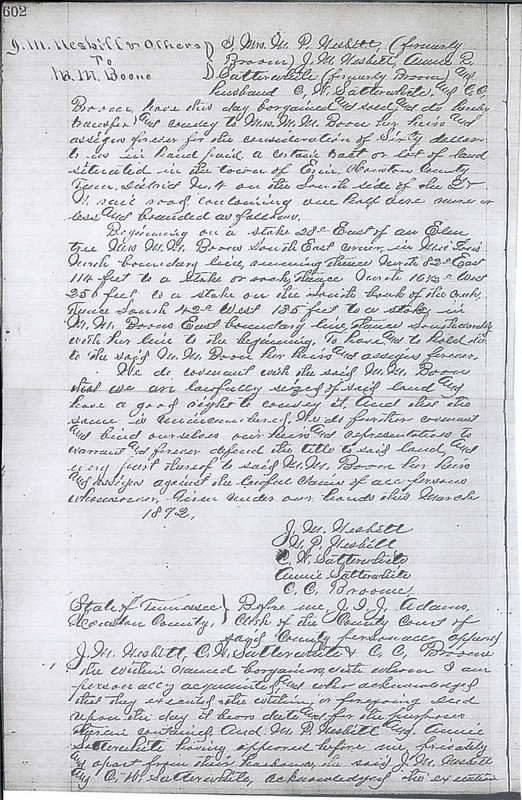 Have you ever read a hand written deed from before 1900? If not, it is an experience you should try at least once – if you have the patience. Needless to say, I volunteered for the job. I had deciphered some old deeds from the 1800’s passed down in my husband’s family so I didn’t go into it entirely blind. I’ve also spent time on Ancestry.com reading census records and other handwritten documents. So I used those experiences as a guide. I knew the people involved, at least I knew their names from our genealogical records. Finally, I knew the location of the property. I grew up in the small town and my mother made a point of showing us the property when we were younger. The deeds I looked at were dated as early as 1871 and as late as the 1950’s. The ones prior to the 1920’s were hand-written. The old descriptions might refer to an “oak tree” or a “tree stump” that is long gone and usually list adjoining property owners who years ago sold their land. The people involved are no longer living. Roads have been moved or widened or re-named or no longer exist. So it has been quite a challenge. 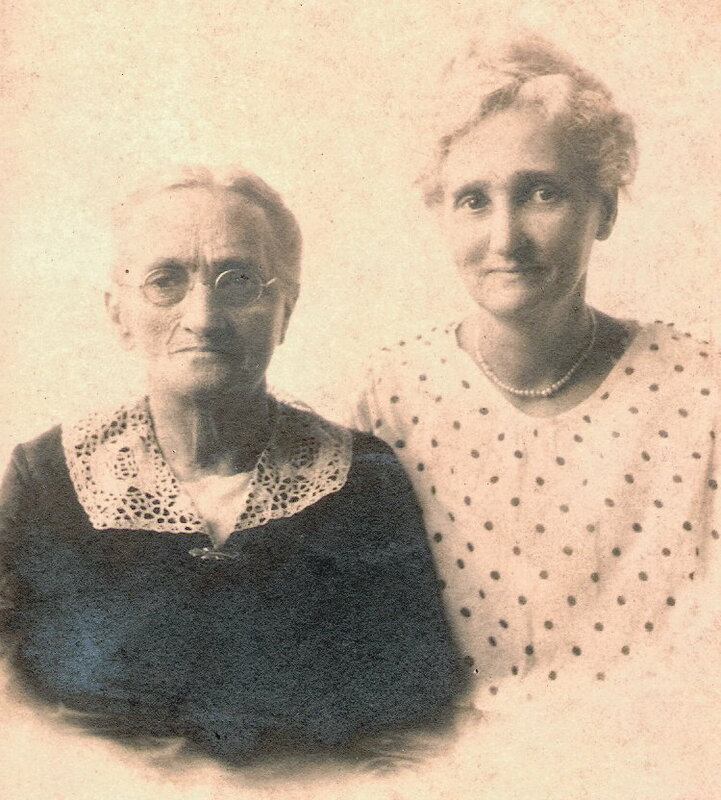 The silver-lining to all this work has been the insight I gained about my Great-grandmother Boone. My mother and grandmother rarely spoke of the woman although she lived near them and was obviously a part of their lives. I got the impression from my grandmother that Great-grandmother Boone was the stereo-typical mother-in-law, always critical. Perhaps that came from her own difficult life. At age 23 she was left a widow with two small children. Both her husband and father-in-law died during a cholera epidemic in 1873. I don’t know how she survived in the ensuing years. I do know that over time she became a business woman. She managed to send her son to Edgewood Academy, a prominent boarding school in the area. And she invested in real estate. By 1900, census records tell us she owned her home, free of mortgage, and she took in boarders. Both the 1910 and 1920 censuses show that she ran a hotel, which she rented, and she had employees. According to family lore, she and her daughter ran the hotel for the railroad. It sat facing the railroad tracks across the street from the train station. She purchased a lot on Market Street (the main drag) in 1914 which became the location of the Central Hotel when the building was moved in 1921. In the early 20th century, Erin was a thriving railroad town where twenty or more trains came through each day because it was the shortest route from Nashville to Memphis. The high ridge west of town meant each west-bound locomotive needed the help of a hill engine to get it to the top of the hill. The train would stop in Erin so that the additional engine could be hooked up. A turn-around track enabled the hill engine to reverse directions both in town and atop the ridge. Over time the railroad decided that a longer route was more economical than utilizing the hill engine so traffic declined. But during the railroad’s heyday, my great-grandmother’s hotel would have been a thriving business. When her daughter-in-law died in 1911 leaving six small children, my great-grandmother refused to raise her son’s children. She was 61 and running her own business. 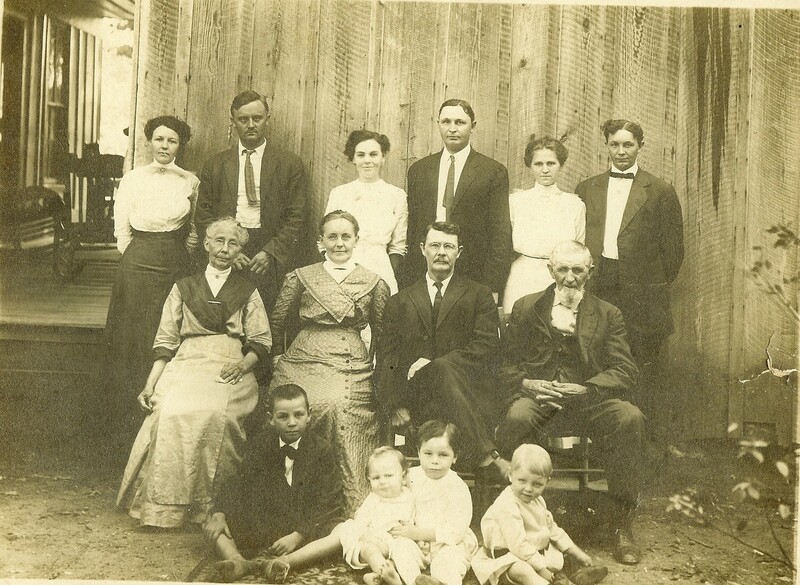 My other, and younger, great-grandmother and great-grandfather moved in with my grandfather and took over the day-to-day responsibilities of running the household and caring for the children. Comments in later years from one of my aunts conveyed my grandfather’s disappointment in his mother. Family resentment carried down through the generations. As a career woman and grandmother myself, I have some understanding of my great-grandmother’s viewpoint. She had raised her children to adulthood alone. She had moved on to become a business woman active in her church and community. At her age taking on the responsibility of caring for a baby, a toddler, pre-schoolers and school children must have seemed an insurmountable task and a drastic change to her lifestyle. So I can sympathize with her decision. She didn’t abandon the family. She was nearby to provide support and guidance. As the children grew older she let them work at the hotel, she set a high standard for her grandchildren’s behavior, and, I’m sure, she contributed financially to their support. Yes, my great-grandmother Boone was a strong, independent woman well ahead of her time. And I’m pleased to have learned more about her and her many real estate transactions.